The 10 Best Farmers Markets in Nebraska! Farmers markets provide a friendly, fun atmosphere to pick up some of the freshest produce around—and in Nebraska, there’s no shortage of them. Nebraska farmers’ markets span across the state and in recent years, more and more seem to be popping up or expanding, attracting thousands of visitors. Here’s a look at 10 of the best farmers markets in Nebraska! Many locals say the best part of summer in Omaha is the farmers market. 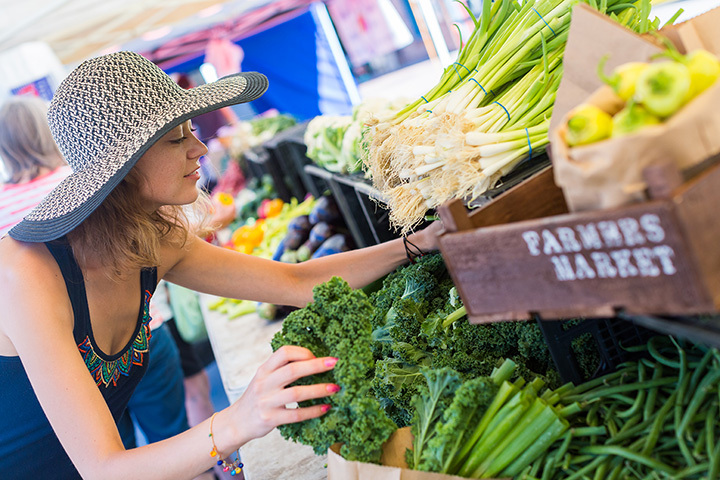 As the largest farmers market in Nebraska, the Omaha Farmers Market in the downtown Old Market features over one hundred vendors and attracts thousands of visitors each season to shop produce, meats, plants, baked goods, fresh cheese, crafts, and much more. On Saturday mornings in Lincoln, the Haymarket district transforms as more than 100 vendors set up to sell their farm fresh produce, baked goods, flowers, and more all along the streets and sidewalks. This relatively new farmers market in the Aksarben Village in Omaha has quickly expanded and now features more than 85 vendors offering fresh fruits and vegetables, music, and other craft goods. Located in the beautiful Washington Park, the Bellevue Farmers Market is the perfect weekend outing thanks to its family-friendly (and pet-friendly!) atmosphere. Events are organized each weekend along with cooking demos and hands-on activities for kids. Established in the 1970s, the Kearney Area Farmers Market features more than 50 vendors sharing their freshest produce and products with the community. You can find a wide variety of goods for sale—from canned vegetables to bison meat! Located in the parking lot of the Village Pointe Shopping Center in Omaha, this farmers market is focused solely on fresh produce with an emphasis on sustainable agriculture. You won’t find any crafts or processed foods here, but instead an incredible selection of grass-fed meats, free-range pastured eggs, artisan cheeses, honey, and flowers. When the weather gets warmer, producers from across the Grand Island area gather in the city to bring the best of what they have to offer. Being situated in the heart of Grand Island offers visitors a nice way to start their day picking up fresh produce and spending the rest of the day shopping nearby. Throughout the season, the Old Cheney Road Farmers Market in Lincoln brings 45-60 vendors together to sell their goods in an open-air style market in a beautiful setting. The market is right near a creek with shady trees and lots of seating to enjoy. The market is also producer-only, meaning everything sold is guaranteed to be grown or processed by the vendors themselves. The North Platte Farmers Market attracts vendors from six nearby counties and visitors can purchase the freshest fruits and vegetables from local these farmers. The weekly market also hosts “Special Saturdays” and other fun activities to enjoy. The Benson Farmers Market offers an amazing variety of fresh produce, baked goods, artisan foods, and much more. Live music is on every week as well as special events such as Nebraska’s only tomato contest! View more Nebraska Farmers Markets.